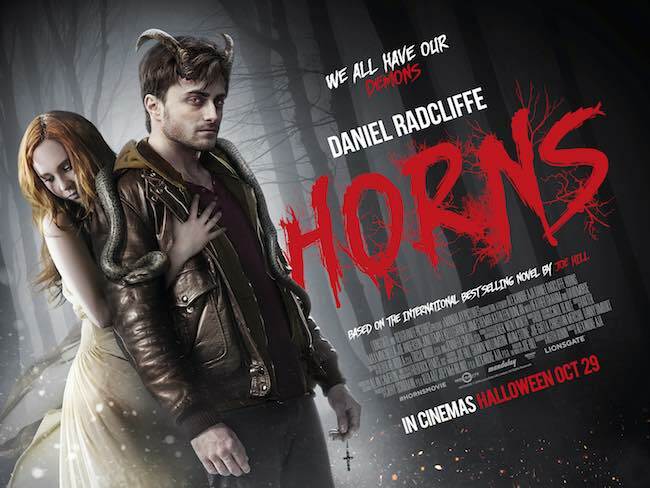 FilmJuice Competition: WIN A COPY OF HORNS TO CELEBRATE THE RELEASE OF THE MOVIE ADAPTATION Just in time for Halloween, the dark supernatural thriller HORNS will rear it’s head in the UK on October 29th 2014. Bought to you from master-of-horror Alexandre Aja, and starring Daniel Radcliffe and Juno Temple, the film is based on the dark fantasy novel of the same name from New York Times best-selling author, Joe Hill. To celebrate the release, Lionsgate UK and Orion Books are offering THREE lucky winners the chance to win a copy of HORNS the novel. Entrants must select the correct answer and fill out the entry form with correct contact details in order to be in with a chance of winning. 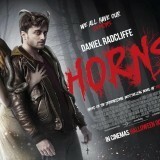 For your chance to win, simply answer this question (entry details at the bottom of page): Who is the author of HORNS? This prize draw is run by Lionsgate UK, the trading name of Lions Gate UK Limited, 60 Charlotte Street, London, W1T 2NU (the Promoter). Open to UK residents aged 15 and over. Proof of age and residence will be required before the prize is dispatched. To enter the prize draw, entrants must select the correct answer to the question above and submit their name, address, email address and telephone number to competitions@filmjuice.com Entries received by any other method will not be accepted. This prize draw is not open to employees of the Promoter, the Promoter’s advertising agency, associated agents or anyone concerned with this promotion. Bulk entries made from trade, consumer groups or third parties will not be accepted. No purchase necessary to enter. Only one entry per natural person is permitted. The winners will be notified by email on 1st December 2014. They will have five (5) working days to respond in full to the email or another winner will be drawn. The Promoter’s decision is final and no correspondence will be entered into. Odds of winning depend on the number of eligible entries received. To be informed of the winners’ names, please send a stamped self-addressed envelope to Horns Novel Competition, 45 Mortimer Street, London W1W 8HJ. The Promoter will not pass on any emails/contact details to third parties unless required to do so by law or an appropriate regulatory authority. The prize is non-transferable, non-negotiable and non-refundable and there is no cash alternative to the prize.Prizes may not be sold, offered for sale or used in connection with any other competition or promotion by the prize winner. The prize is subject to availability and the Promoter reserves the right to (a) award an alternative prize of equal or greater value and (b) in exceptional circumstances to vary, amend or withdraw this competition on reasonable notice.